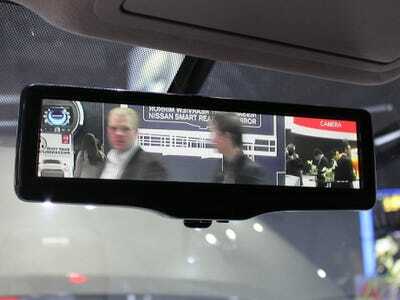 Alex Davies / Business InsiderNissan’s ‘smart rearview mirror’ in LCD camera mode. Americans have gotten used to rearview cameras, which make driving in reverse easier and safer and will be required on all new cars by May 2018. Now, Nissan is taking the next step forward, adding the benefits of a camera to the rearview mirror. The “smart rearview mirror” looks like a standard mirror, but when the driver flips a switch, a much clearer view of what’s behind the car is shown, piped in from a camera in the rear windshield. No more struggling to see past tall passengers, headrests, and piles of suitcases. Fantastic. The mirror itself meets federal regulations and is available if the camera ever fails, or if the customer prefers to go old school. But we’re guessing that once drivers get used to the LCD screen mode, they will stick with it. U.S. customers got their first in-person look at Nissan’s mirror at the New York auto show the past April.